Atlanta plastic surgeon Dr. Thomas Lintner worked with our team of writers, designers, and developers to construct a website that focused specifically on the wide range of aesthetic enhancements available to mothers. Seeking to convey the beauty and grace of motherhood, Dr. Lintner and Rosemont Media crafted a completely unique and custom graphical design and structure that combines an artful layout with conversational, reader-friendly content. The new website features redesigned video and photo galleries that display Dr. Lintner’s work in a tasteful portfolio of breast augmentation and mommy makeover results, while the procedure information reads in his personable, friendly tone. With social media connectivity and an easy-to-use contact page, the site enhances patient communication options and increases Dr. Lintner’s ability to provide the highest quality patient care. 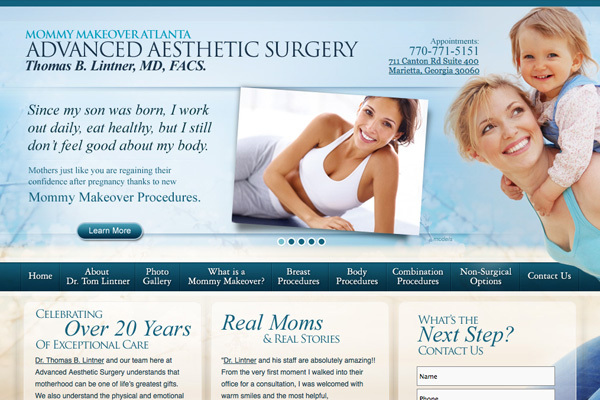 Rosemont Media also utilized the latest in plastic surgery website design techniques and strategies to optimize the Atlanta mommy makeover website for success in search engine rankings and patient visibility. Dr. Lintner had an integral hand in every step of the development process, as his stamp of artistic skill and professional experience is evident on every page. To get a better picture of the type of website Rosemont Media can create for you and your practice, visit atlantamommymakeover.com.